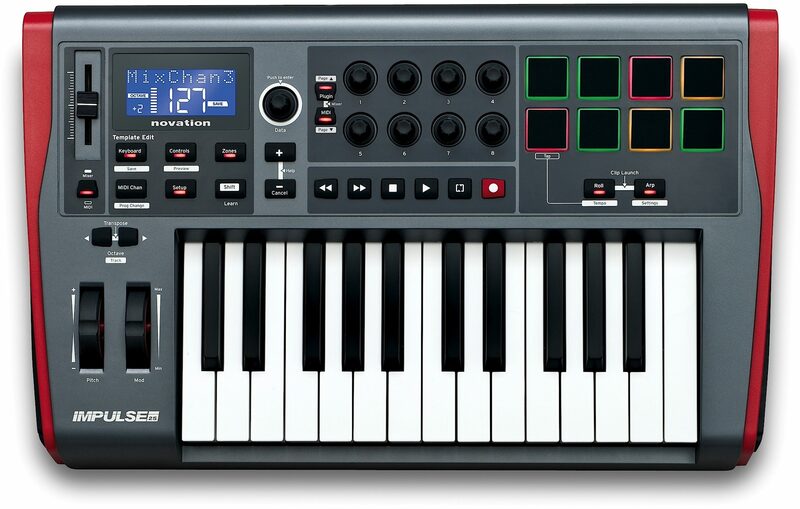 Impulse is a range of professional USB/MIDI controllers. As well as a precision keyboard, drums pads and a full control surface, it comes with an updated version of Novation's award-winning Automap control software - Automap 4 - which makes getting hands-on with your DAW/plug-ins fast and simple. Impulse also comes with Ableton Live Lite, Novation's Bass Station synth and a 4GB Loopmasters sample pack. The ultra-responsive keyboard is semi-weighted with aftertouch so it feels like a musical instrument. Impulse enables highly expressive playing styles due to its high scan-rate. This means it sends very accurate information about your playing style to your music software, translating subtle differences in dynamics extremely effectively. You can add further character to your performance with the pitch and modulation wheels. The 8 drum pads are perfect for sketching beats and triggering samples, but they do so much more: All 8 are back-lit with multi-coloured LEDs which means they can step through arpeggiator sequences, allowing you to warp and change the pattern in real time! There is also a beat roll function, which enables you to improvise with drum patterns on the fly. In addition to this, the drum pads can be used to trigger clips in Ableton Live. They light up yellow if a clip is loaded, green if it is playing and red if it is set to record. Impulse is designed to give you full hands-on control of your music-making software. The knobs, faders and buttons give you control over your DAW's mixer as well as plug-in instruments and effects. The included Automap control software has been designed solely to connect hardware controls to your software - even VST/AU/RTAS instruments and effects that don't come bundled with your DAW. The large custom LCD screen shows important information about what you are controlling. Impulse has transport buttons that allow you to play, stop, record, loop and move forwards and backwards in your software. Impulse can be USB powered from your computer or if you want to power it independently you can use a simple USB power adapter (not included). 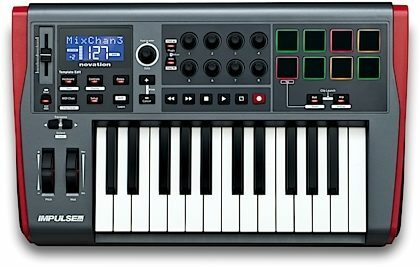 There are expression and sustain pedal inputs on the rear panel, and it has MIDI in and out ports so you can use it as a USB-MIDI interface. This means that you can control external MIDI instruments with Impulse, and you can also use it to enable your music software to trigger external MIDI instruments.